The two main conveying systems are pressure and vacuum conveying for pneumatic conveying within the plastics industry. A combination of both systems is also possible, such as in the case of venturi material loaders. Pressure conveying refers to systems where the material is conveyed from the material supply to the destination via pressurised air. 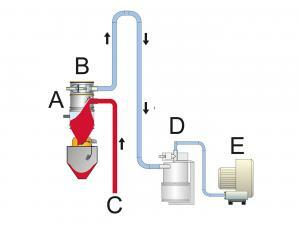 In doing so, the material must be channelled into the pressurised material feedline. This requires a special input of the material. This is often realised through the use of rotary gate valves and pressure containers. Pressure conveying systems are often used for very large throughputs, difficult materials, and large distances. Vacuum conveying (also called suction conveying) is the most common conveying principle used in the plastics industry. A vacuum pump (E) generates either a centralised or decentralised vacuum. This results in material being sucked up (C) by the material supply (suction pipe, suction probe) and conveyed to the material loader (B). There the vacuum air is separated from the material (A). The vacuum air reaches the vacuum pump (E) via a filter (D) and is released back into the environment. Vacuum conveying is used both for single units as well as a complex conveying systems. Systems with numerous processing machines and different materials can be effectively supplied because of the flexibility of the vacuum conveying system. Material loaders that operate according to the venturi principle assume a special status. A vacuum is generated with the help of pressurised air and a venturi valve (named after Giovanni Battista Venturi, an Italian physicist). This results in material being sucked into the venturi valve and is conveyed to its destination with pressurised air. 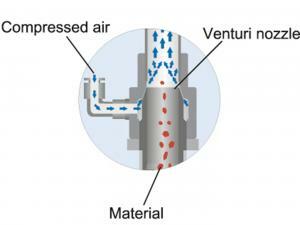 Technically, therefore, a venturi material loader works according to the suction-pressure principle. Venturi material loaders are mainly used for small to medium throughputs and are particularly suited when space is limited due to their compact build.